Almost everyone has heard of Madame Tussauds, the famous wax museums with locations in New York, London, Los Angeles, and several other major cities. But how much do they know about the museums’ namesake, Marie Grosholtz, who began her career working with her “uncle” Philippe Curtius in his Salon de Cire, and who played a role in the French Revolution? As I predicted, this was my least favorite of Michelle Moran’s novels, but not particularly through any fault of her own. As with the others, Madame Tussaud is written beautifully in the first person and present tense. It is conversational while still relaying historical facts. 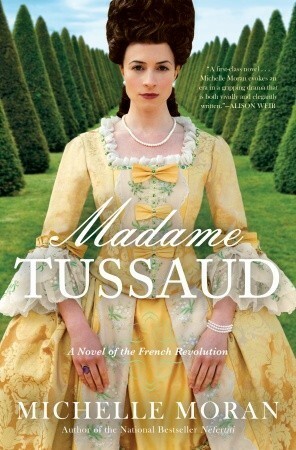 Also similar to her other novels is that, at its core, Madame Tussaud is a love story in two ways. Marie has a romance with her scientist neighbor, Henri Charles. This is where I had to detract points from my rating. While the love story angle makes sense in her previous novels, it felt out of place in this one. Moran does take occasional liberties with history, but I felt that her inclusion of Marie and Henri’s affair could have been left out. It was too sudden, at least on Marie’s part, to make sense. Henri clearly had feelings for her, but hers came pretty much out of nowhere. And since the relationship is brief due to Marie’s dedication to her work and family — at least until she finally sails to London after leaving her husband, François Tussaud — I doubt that the novel would have been worse off without it. While French history isn’t a particular interest of mine, I was happy that what Moran wrote jibed with what (little) I remember from history classes of yore. In fact, the reign of Louis XVI and Marie Antoinette and the ensuing French Revolution is probably the only part that I remember. The personalities of the people whose names I am familiar with seemed accurate with what I could recall, especially that of Robespierre. But I knew so little about Marie that Moran’s portrayal of her as a brutally honest and shrewd businesswoman was entirely new to me. This is the second way that the novel is a love story. Marie loved her work, to the point of letting the man she loved go to London so she could stay at the Salon de Cire. And though her skill brought her fortune and fame, it also came at a terrible cost. Her relationship with the royal family — as the tutor of Madame Elisabeth, the king’s sister — meant that her own family had to carefully straddle the line between being royalists and revolutionaries. Angering the wrong person could mean death for them all. Marie, her mother Anna, and uncle Curtius had to be careful about how they displayed their loyalty at every turn. Overall, I very much enjoyed Madame Tussaud. I love Moran’s writing, and how she can describe the atrocities at Madeleine Cemetery and the Marquis de Sade’s depraved novel 120 Days of Sodom (which he wrote while imprisoned at the Bastille) and seamlessly move into happier moments such as the marriage of Marie’s brother, Wolfgang, to a baron’s daughter, and the birth of his son. There are also some touching moments between Marie and the queen, and Madame Elisabeth that are very beautiful written. I think Moran is a brilliant author of historical fiction, and I look forward to her next novel (which also deals with French history), The Second Empress. Tagged french history, french revolution, louis xvi, madame tussaud, marie antoinette, marquis de sade, michelle moran, robespierre, the second empress.